If you require unique protection against a variety of chemicals, NeoPro® gloves are your best defense. NeoPro® gloves bring you a revolutionary softness in an exclusive chloroprene blend, with puncture and chemical resistance greater than natural rubber latex in some cases*. 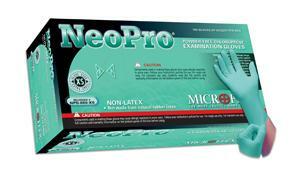 NeoPro® gloves are the unique exam glove that provides that provides effective resistance to some chemicals*, with comfort close to latex.